When have you recently experienced beauty? What are some of your most beautiful experiences? Before you answer let me explain what I am asking. I am not asking when you saw something you thought was beautiful. I am not asking about physical beauty, the outward appearance of people or things. I’m asking about moments and situations in which you experienced and participated in beauty not so much with your eyes or your mind but with your heart. I am taking about those times when “the beautiful meets us and we know it intimately” (Evdokimov, The Art of the Icon, p. 20), not as an object but as a presence greater than ourselves. We are grasped and enfolded by the beauty and it shapes and forms our lives leaving us forever changed. The beauty that I am speaking of cannot be defined. It can only be encountered and experienced. It’s more than what our words can describe but is often named by our tears. I’m sure you’ve all had those times when the beauty of the moment fills your eyes with tears and all you can say is, “It’s just so beautiful.” I can’t explain what I mean by beauty or how it happens so let me just tell you some of my experiences of beauty. Perhaps that will prompt or help you to recognize and recall some of your own. I hope it does. I remember the night my younger son was born and the nurse placed him in my hands and said that I could carry him to the nursery. I saw his face for the first time. I heard his cry. I touched his little wrinkled fingers. But there was so much more than what I was seeing, hearing, or touching. I had been enveloped in beauty. More than twenty years ago I knelt before Cyndy one afternoon and asked her to marry me. I looked in her eyes. I felt her hands in mine. I heard her say yes. But there was more. Beauty had wrapped itself around us. I will never forget the day we buried our older son. After we came home from the cemetery I was lying awake on the bed and suddenly he was there. He was a little boy and I was giving him a piggyback ride. I could feel the weight and warmth of his body on my back. I felt his right knee gouging my ribs as he bounced up and down. It was breathtakingly beautiful. I know a couple who has been married probably sixty years. For several years one of them has had some serious medical challenges. The other is always there; patient, gentle, caring, attentive. I love way they talk to and about each other, the way they look at each other, the way he teases her and the way she corrects him. When I am with them I know that I am standing in the midst of beauty. There’s a little girl, about two years old, who comes up here for communion. As soon as she steps up to the altar rail she smiles, opens her mouth, reaches out her hands, and begins bouncing. Beauty is making itself known. About a month ago I took several pictures of Cyndy and me from our sabbatical, made a movie, and set it to music. We watched and wept together, enraptured by beauty. One Thursday a few weeks ago I stood at the back door of the chapel and gave the dismissal for the Holy Eucharist. I went outside to visit with the people as they left. When I went back in the chapel there was a sweet fragrance. It had not been there before and it wasn’t perfume. Beauty was present. It was the fragrance of beauty. This is happening all the time. These stories aren’t about just me. They are about beauty. Neither are they only my stories. They’re your stories too. We all have them. We are always waking up to the presence of beauty in ourselves, each other, and the world. How could it be otherwise when one of the divine names, one of the names for God, is “The Beautiful One?” Why wouldn’t The Beautiful One make himself known through and regularly invite us to participate in beauty? Holy Scripture tells us that the Creator looked at all creation and declared it to be “very good,” but did you know that the Hebrew word translated as good also means beautiful? What does it say about us that we have been created in the image and likeness of The Beautiful One? Here’s what I think all this means. We have been created with an eye for beauty. We are to live with an eye for beauty. We are to see ourselves and one another with an eye for beauty. An eye for beauty opens us to the transfiguring presence of God in every human being, in our lives, and in our world. Beauty connects us to our truest and most authentic self and it is available to all who keep awake. So, what are your stories of beauty? When have you known and participated in that presence that can only be described as beautiful? Tell me what happened, where you were, who was there. When has the beauty of the liturgy, a piece of music, poetry, a conversation brought tears to your eyes? Recall a time when beauty wrapped itself around you and all you could think was, “I never want this moment to end.” The experience of beauty ranges from the most profound and intimate experiences to those fits of holy laughter that leave you with a belly ache and streams of tears. What are your experiences of beauty? Where have you encountered beauty this past week? Whatever your encounters are, they are an encounter with the divine presence, experiences of the Light of God illumining your life, experiences through which your life was transformed and forever changed. They are your experiences of transfiguration, moments and situations in which you had an eye for beauty. I think there is some wisdom for us in the silence of Peter, John, and James. The transfiguration is one of those big stories, mountaintop stories, that can begin to seem a bit too fantastic, unreal, and distant from us. Often we take those kind of stories and either look for some rational explanation or we make it a supernatural event about Jesus that could never happen in the flatlands of our lives. Either way we close our eyes and fall asleep to the beauty of God that is in and all around us. Their silence, however, asks us to just let the story be the story. It doesn’t need to be explained, it needs to be experienced. It doesn’t need to be understood, it needs to be lived. When we let the story be the story we create room for it to become our story. We let it live in us. 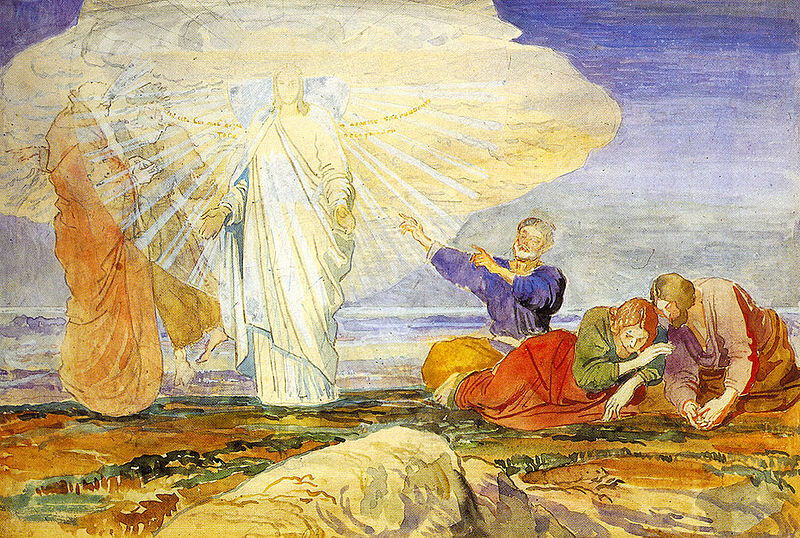 And the story of the transfiguration in today’s gospel (Luke 9:28-36) is the story of the sublime, absolute beauty. While Luke does not explain the transfiguration, neither will he let us be naive about it. I think that’s why in his account of the gospel the story of the demon possessed boy (Luke 9:37-43) immediately follows the story of the transfiguration. Luke is holding before us a truth and a reality about the world and ourselves. Transfiguration and disfiguration stand side by side. They do in each one of us, in our world, and in Luke’s gospel. 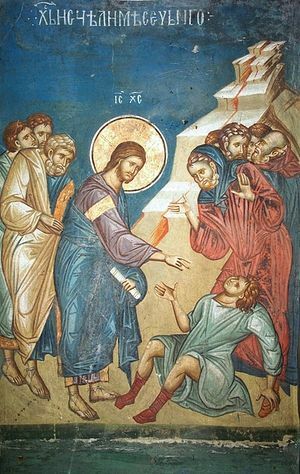 “On the next day, when they had come down from the mountain,” a man brought his demon possessed son to Jesus. He told Jesus that the demon mauls his son and the boy shrieks, convulses, and foams at the mouth. It’s an ugly scene. The boy’s life has been distorted and disfigured. He has been separated from the original beauty of his creation. He has lost touch with his truest and most authentic self. He’s not himself. It’s a story of disfiguration. I’ve known times like that as well and I’ll bet you have too. They are those times when we look at ourselves and our life and we don’t like what we see or what we have become. It’s ugly. I’m not talking about our outward and physical appearance. This ugliness, like beauty, is an interior condition. In those times we are recognizing that our life has become deformed and disfigured. We might even say things like, “I’m just not myself”; “That’s not me”; “How did my life get to this point?” “I don’t know what came over me. That’s not who I am.” What we are really saying is that we’ve lost the connection with the original beauty of our creation. We’ve fallen asleep to the beauty within us, others, and the world. The beauty, however, has not and cannot be lost. It doesn’t matter who you are, what you’ve done, or what your life is like the beauty cannot be lost. Human life and the world have already been transfigured. That’s what Jesus knows and demonstrates with his healing of the boy. Jesus always sees with an eye for beauty. He refuses to let the manifestation of ugliness turn him away. Even within the distorted and disfigured life of the boy Jesus sees beauty. He calls forth and opens himself to the boy’s beauty he knows has always been there. With an eye for beauty Jesus heals and returns the boy to his father. That’s the power of beauty to change our life and return us to ourselves. That’s The Beautiful One healing, restoring, and making whole. That’s the transfiguration in the flatlands of life. More often than not, however, we turn away from the ugly and are either unwilling or unable to trust the beauty within the distortion. I suspect that’s why the disciples could not heal the boy. I suspect that’s why I often avoided Stinky George. I’ve told you about him before. He sometimes came to the church I attended before going to seminary. George was homeless and spent a good part of his day riding the city bus and drinking. He was usually sick and rarely bathed. Many of us, me included, when we smelled George coming, either turned away or gave a quick wave from a distance. The priest of that church, however, would go up to George, wrap his arms around him, and hug him as tight as he hugged any of the rest of us. He had an eye for beauty. He trusted and believed that even in the disfiguration of George’s life the beauty was still there. Every hug was a calling forth of that beauty. I don’t know how those hugs affected George but I now recognize that in the hug of those two men I had encountered beauty. It just took me seventeen years to recognize it. With that recognition comes another reminder that our lives are perpetually held by the sublime, The Beautiful One, even when we don’t know it. Absolute beauty is everywhere. It’s in the transfigurations and disfigurations of life, on the mountaintops and in the flatlands, in you and me, and in those we never would have guessed or thought possible. I don’t want to fall asleep to the beauty and I don’t think you do either. I want to look in the mirror before I go to bed and see beauty. I want to wrap my arms around you and stand together in the beauty. I want to call forth your beauty and I want you to do the same for me. I want to look at the disfigured, broken, and hurting places of our lives and world trusting that beauty is present. Let’s keep awake. Let’s live and see with an eye for beauty. Let’s leave here today knowing that regardless of where we go, what happens, or who we meet Beauty awaits us. Beauty awaits. Brandon, Something here beautiful to share about beauty! Thinking about Bishop Barron’s video on beauty – this adds to it! This has brought a new understanding of the times I’ve been at the deathbed of loved ones and witnessed the transition to the next phase of their life. Especially when part of the passing of our daughter with our family surrounding her. Her estranged son bent to kiss her. It was beautiful. Susan, I am so sorry for the loss of your daughter and so very grateful for the beauty you witnessed. Thanks be to God, and thank you for sharing this story of beauty. You have reminded me that beauty brings consolation in the midst of loss, and reconciliation to the estranged.